With my Dojo complete for Test of Honour, I was able to grab a friend to play a quick run-through of my Dojo Assault scenario. Since we were actually able to test the full rules instead of me trying to run both sides, we were also able to check out the Ninja’s secret objective rule. 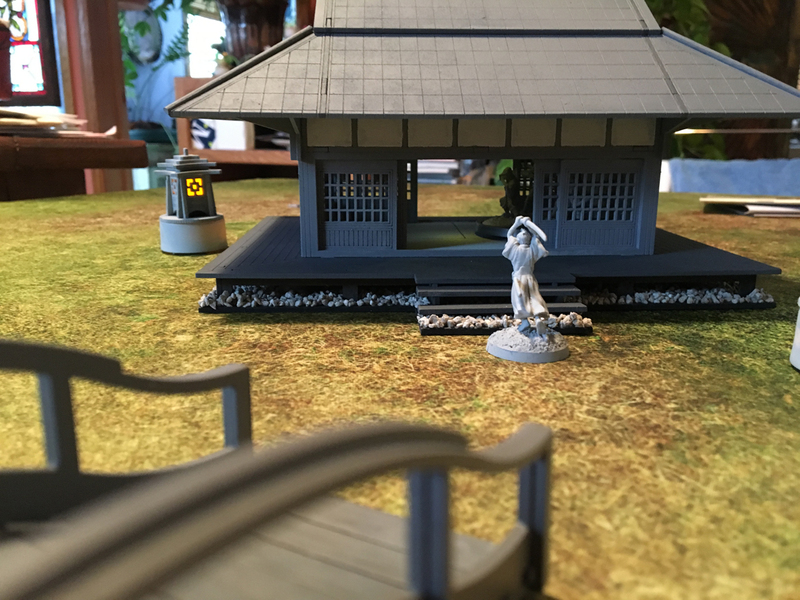 This is arguably the most intriguing part of the light scenario and will hopefully keep the Samurai player from just burning turns waiting inside the Dojo. My friend took the Ninjas and drew his secret objective, then we set up the 2′ x 2′ board using his game mat. Eventually I’ll have more terrain in B/W to make the board more interesting but for now, we’re still playing on a pretty plain layout. 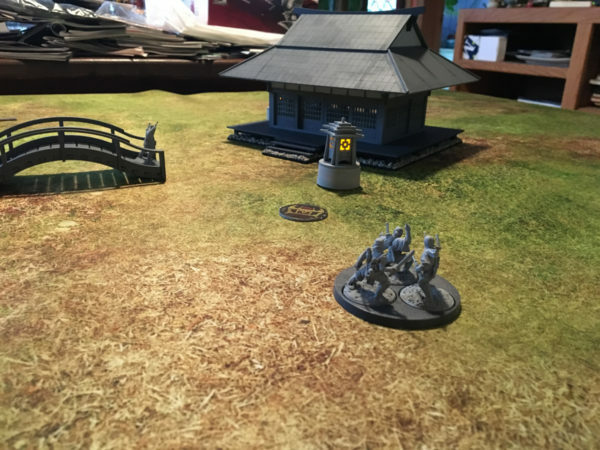 The Ninjas set up with one group on the backside of the Dojo, another group on the far front and the last lone Ninja on the bridge. After a few ninja activations in a row, the Samurai was able to come out. I could have kept him in the Dojo but the front group of Ninjas were really close the “Well” objective marker and we modified the search rules so that you could search even if an enemy was within 3 inches. 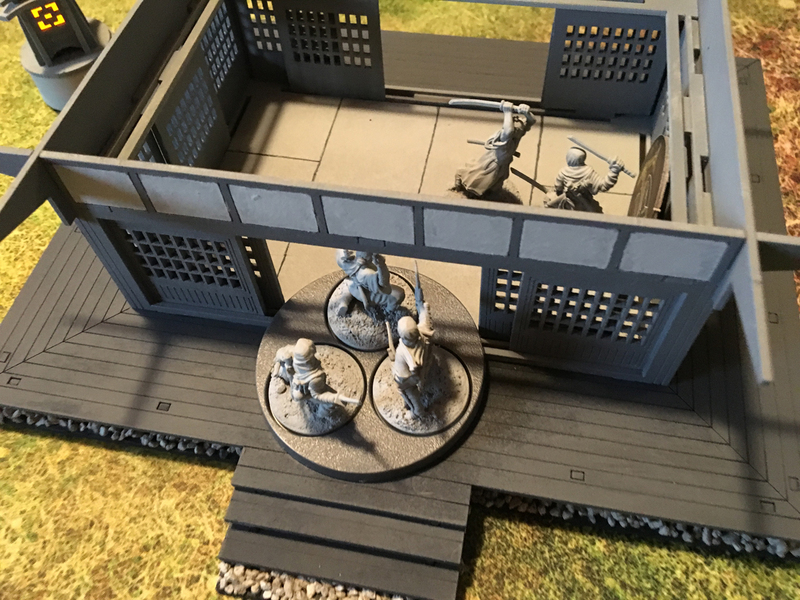 This is also to prevent the Samurai from just camping in the Dojo and never needing to leave. 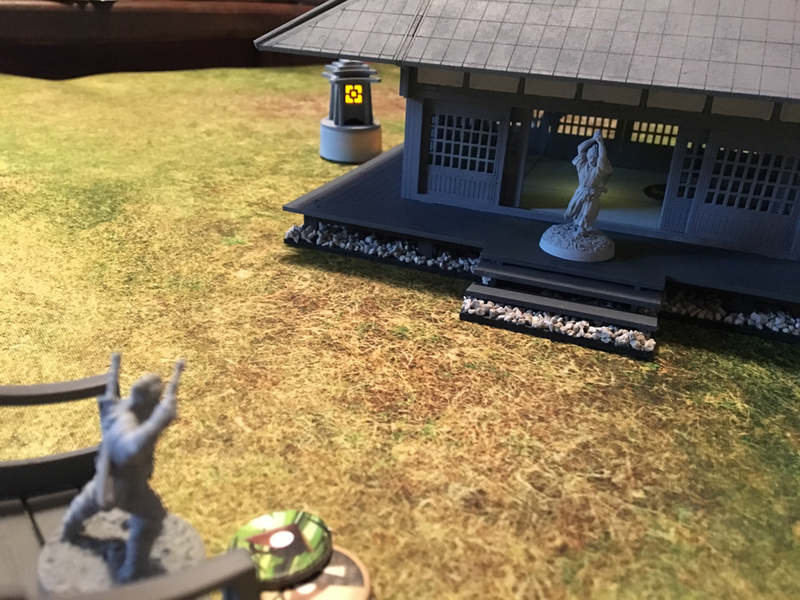 With only fate and samurai tokens left in the bag, I was able to get second turn with Kamiizumi-kanchou and so I charged the lone Ninja on the bridge. My friend tried to persuade Kamii off such an action claiming that he was merely looking for training. In the middle of the night. With a few of his best buds all dressed in black. You know, no big thing. Get off my lawn! 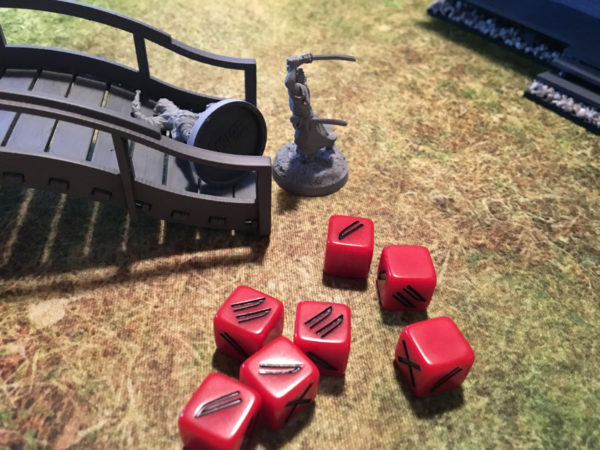 as Kamii just cuts the trespasser down, spilling blood all over his new and totally useless bridge. Lucky for the front Ninja group, they were out of range of both the nerve check (after watching their friend get hacked in two) and Kamii’s follow-up charge. 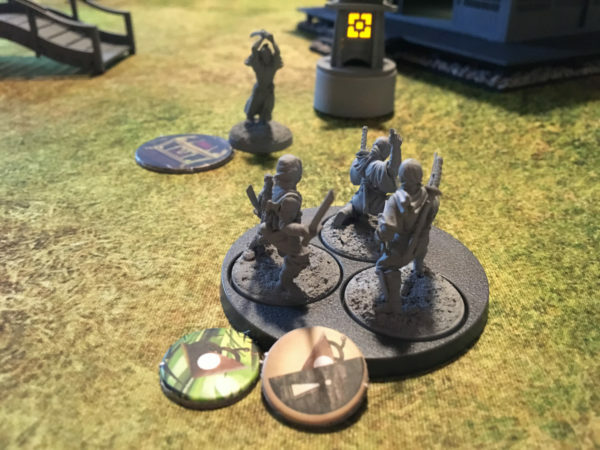 Their luck held as we drew the last fate token to end the round before Kamii could take his final action. 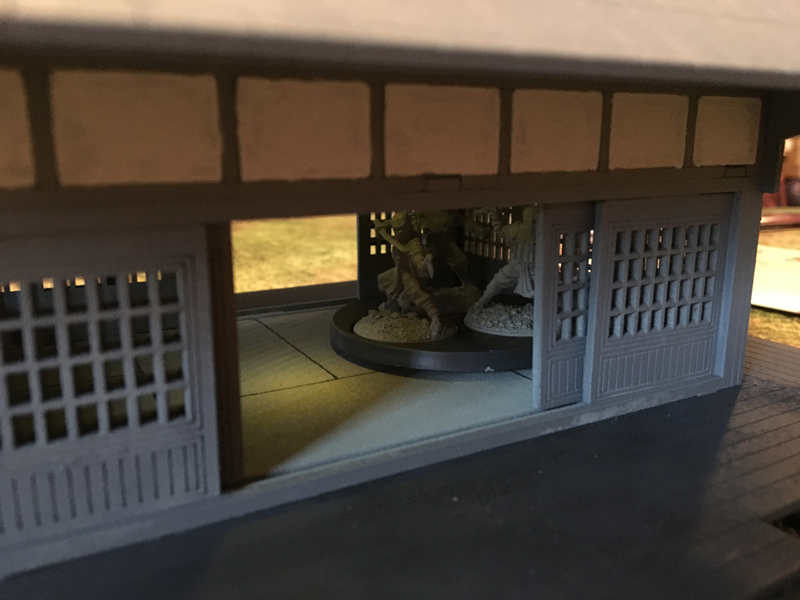 With all the excitement, Kamii didn’t realize that the group of Ninjas in the back had made it into his Dojo. What the hell did these clowns want? Kamii goes after the Ninjas in his front yard but fails to even land a blow. Then it dawns on me that they might be the distraction while the pajamas all up in my crib are doing some nefarious crap. Kamii rushes back to the Dojo to lay down some epic justice. The round ends again with Kamii getting 2 of his 3 activations. But I was right! Those bastards were ripping up the place looking for something. At this point we had to pause the game to discuss something as we realized the Ninja player couldn’t simply say they “searched” because the results of the search mean two different things. If they pulled the commoner objective and were searching for the Clan Scroll, they’d need to acquire the token and carry it off the map. 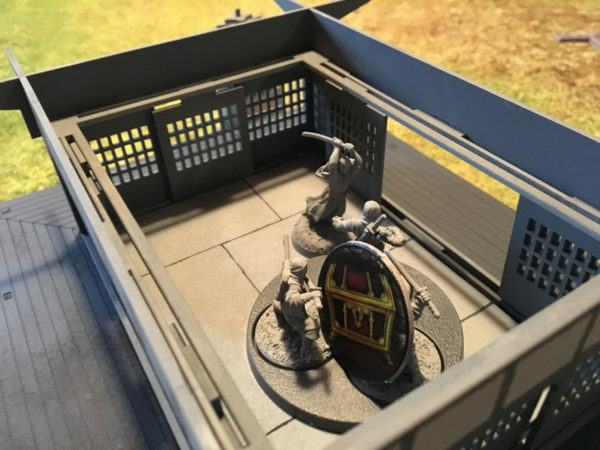 If they were “searching” to poison Kamii’s food storage, then they would achieve that part of the blood token objective. Either way, it would be obvious to the Samurai player what happened and the objective would be known. That’s not a bad thing but meant that the Ninja player would need to say what they were doing with the search action: looking for the Clan Scroll or poisoning the food. That led to an interesting thought that maybe all objectives should be available but the Ninjas can secretly only win one. By allowing the Ninjas to perform any action they want, they don’t give away what they are doing and can still mess with the Samurai player. My friend was looking for the Clan Scroll and I rightly assumed that that was his objective. It would have been interesting if he actually was looking to poison the food and just had me waste time chasing him into the dojo to allow for his other group to freely poison the well instead. I’ll need to modify the instructions a little to compensate as it was a clarification that we both seemed to like. The Ninjas succeeded on finding their scroll so now they needed to just get out of there. But Kamii was too quick! and arrived just in time to attack. Unfortunately, Kamii is getting a little on in years and totally whiffed his attack. We ended up drawing his last activation before the round ended and again, Kamii couldn’t land a blow. Round four started with three back-to-back samurai token pulls and while Kamii still whiffed his first two activations, he went total Mifune-Kikuchiyo crazy on the group with his last activation, scoring crit after crit and getting a follow up, cutting down two ninjas in the group. 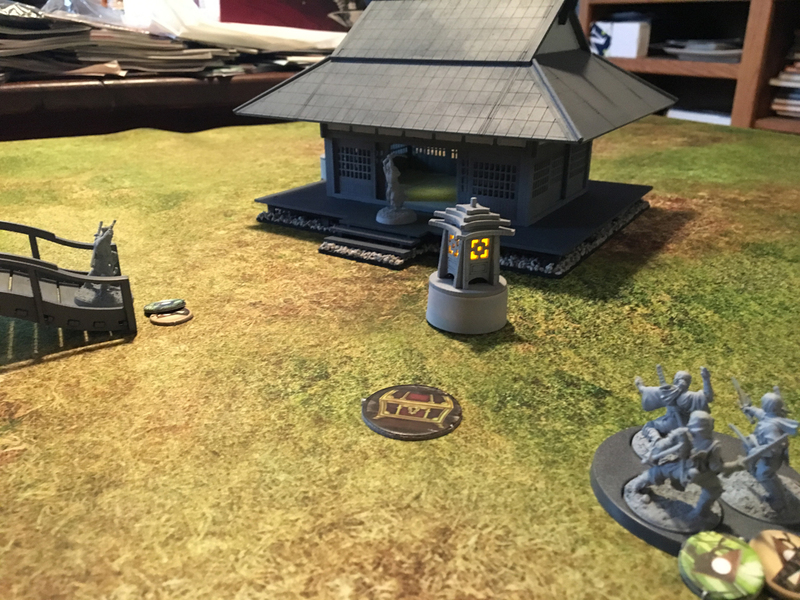 The last activation of the round fell to the last Ninja group who were able to rush to Dojo and lend some much needed aid to their failing brethren. 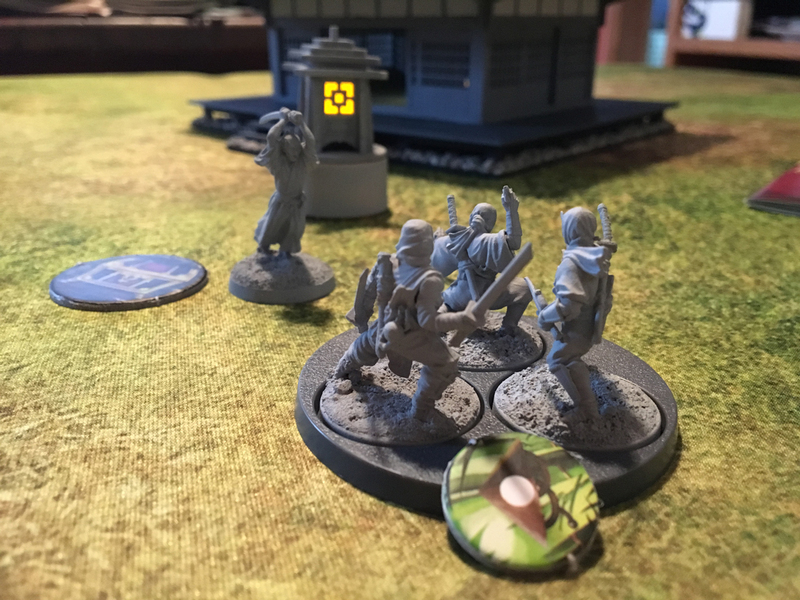 We draw round five’s first token and it is another Samurai token. 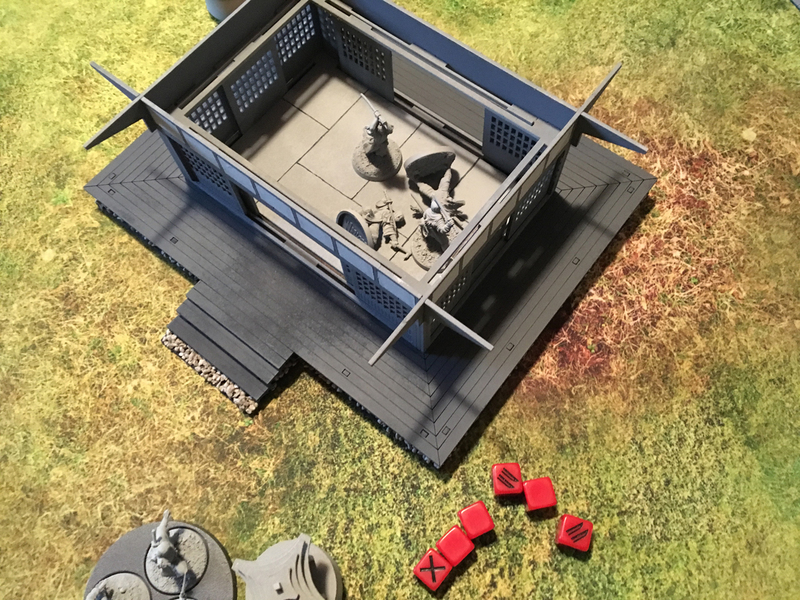 That makes five in a row from rounds three and four then round five starts with Kamii just slaying the Ninja intruder before the eyes of his friends. 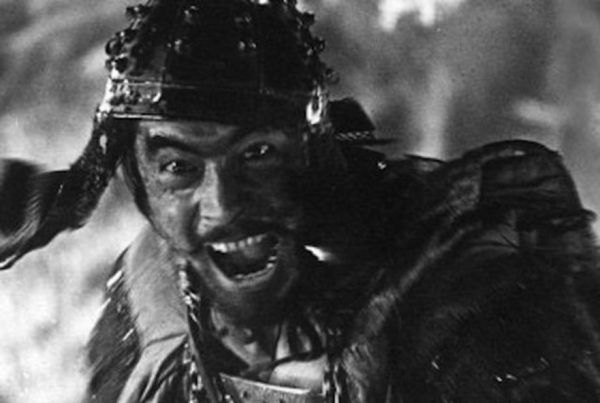 Samurai wins! 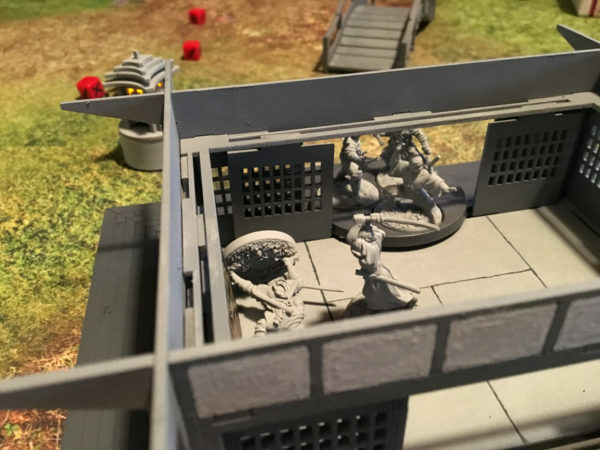 We both thought the scenario worked well and, in general, achieved what I was after: a quick, interesting scenario to play using just the figures from the Dojo Assault set and act as a more robust starter scenario than the core set provides. It is more advanced than the core set opening scenario but I don’t prohibitively so. Balance is hard to judge from just this one game. There were a lot of swingy things going on heavily in the Samurai’s favor with all the activation draws in a row and my dice were crazy hot, landing 5+ swords half a dozen times throughout the game. I fully recognize that the three different Ninja objectives are likely not balanced but I’m fine with that as long as they are at least doable. 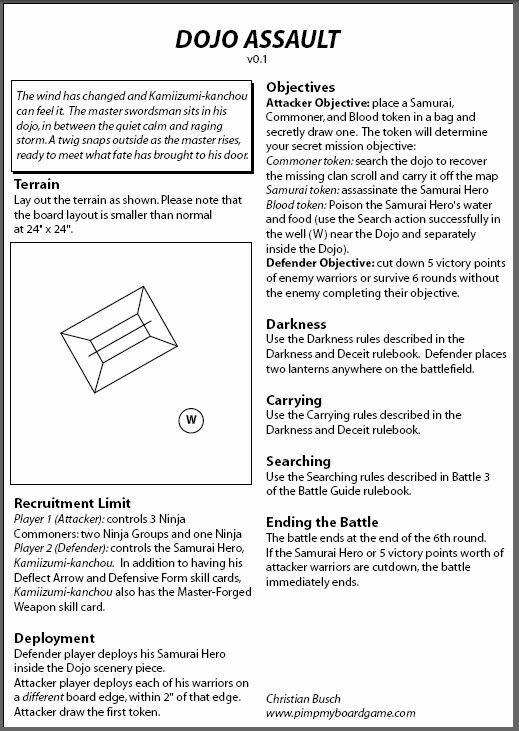 I think the Scroll objective may be too much though as it will be very tough for the Ninjas to get off the map with it. Ultimately, I would like to have another location out of the Dojo that the scroll could be so that the Samurai has to make decisions on where he wants to try to protect. If the scroll and the poisoning aren’t in the same place, then it eliminates the need to claim what you are doing as the action will be obvious. I still like that the Ninjas can do whatever they want, even if it doesn’t move their actual win condition forward as it gives the players options to feint tactically. I might also look at changing the Ninja composition. Maybe something like swapping out the lone Ninja for a Ninja Lieutenant. This would up the total Ninja points to 12 instead of 8. While that seems a significant point differential between the Samurai and Ninja, the Samurai seems to have a significant advantage in multiple activations and activation denial if he can strike a commoner group first. The Ninja Lieutenant would also play an interesting role in the token meta as you would remove 1 commoner token and add 2 samurai ones. 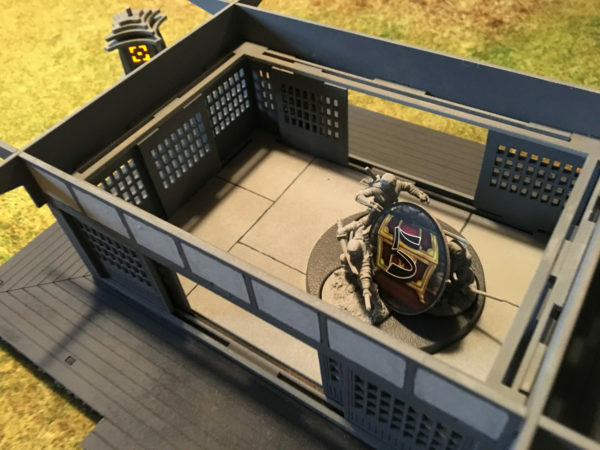 This would make keeping track of who is drawing from the bag actually matter (as it stands, it doesn’t matter who draws from the bag since the tokens are evenly split among the two players and neither side shares the same general unit type. More testing is needed but I think this is coming along well and I like how the whole scenario is shaping up.